Clay is heavy so we need to build a strong metal frame or armature to support it. At this stage I usually work with the sculptor Mark Longworth who’s great at planning out a rigorous structure. He comes to my Gothic studio in the heart of the West Sussex countryside for a couple of days. We’re ready. I’ve sourced and varnished the ply wood for the two platforms to support both the Cracker Packer sculptures and assembled the two new hydraulic platforms that will lift the statues up and down to facilitate my sculpting. 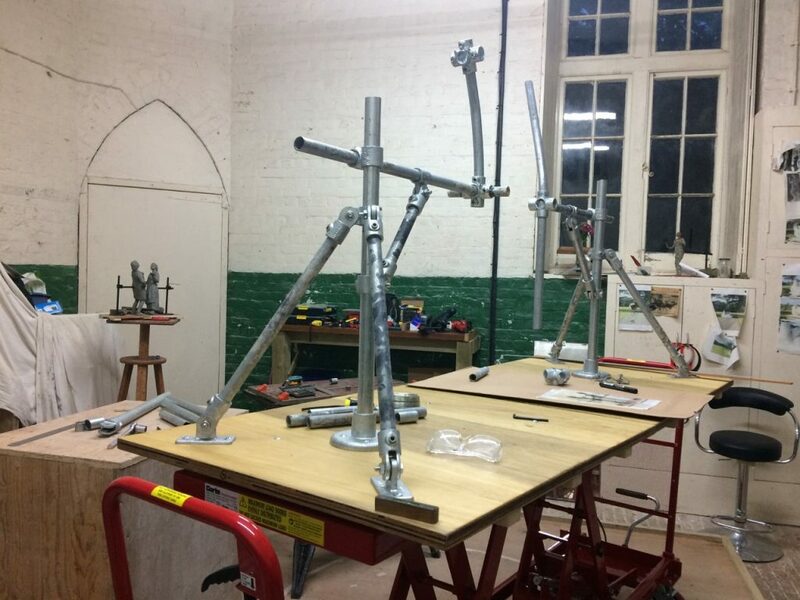 The additional Kee Clamp metal tubes and joints – like scaffolding – has arrived. We screw on wooden batons to the plywood, for extra strength, and then bolt the ply sheets onto the metal platforms of the lifting tables. Now we start the scaling-up process. How much larger than the maquette will each figure be in the final statue? How much allowance do we need to add for the potential shrinkage during the bronze casting process? I add an additional 1.7 percent to take into account shrinkage. The planning permission was granted on the basis of two figures of 115cm and 107cm heights. Slowly I calculate the lengths of tubing we need to give us the right heights and lengths for the basic armature structure. 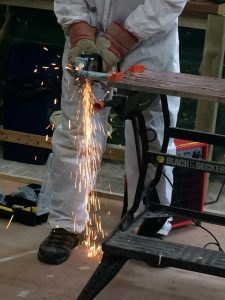 Mark cuts the lengths with the angle-grinder. The ‘back irons’ will bear most of the weight of the clay. These are screwed onto the ply base sheets. Before the end of the second day we bend the Kee Klamp tubing to reflect the spine of the two figures – both figures are bending a little backwards. A very productive two days. Now it’s down to me to do the detail of the armature over the next few weeks.